Aloet is typical of many inland valleys in East Africa. The valley edges and bottoms are used almost exclusively for rainy-season rice production, and a smaller number of farmers also plant rice in dry seasons by diverting water from an upslope spring into their fields. The Innovations in Dry Season Horticulture project works with a group of mostly women to develop dry-season vegetable production in the areas traditionally used for rice. Because these plots are prone to waterlogging in rainy seasons or during off-season storms, vegetable production in the valleys was previously not thought to be possible. The group members had limited experience growing vegetables on the mid-slopes of the area, and irrigation was only done by carrying water in jerricans to the upland fields. Aloet is located in eastern Uganda’s Teso subregion. Teso is characterized by a mildly undulating system of ridges and valleys, with a few prominent wetlands in the east and center of the region. The soils tend to be sandy to loamy topsoils over lateritic subsoils, with neutral pH and low natural fertility. The climate is characterized by a main rainy season from March to June, with extended showers up to December, but with less rain from June to September. December to March tends to be very dry. This area supports semi-arid crops better than it does many crops of the humid tropics because of the combination of lighter, free-draining soils and higher evapotranspiration than nearby areas with similar temperatures and rainfall. The main subsistence crops are cassava and sorghum, with sweet potato and groundnut also cultivated widely for market and home consumption. Citrus and rice are common cash crops, and various other crops are commonly cultivated including cowpea, millet, green gram, and maize. Group work days Aloet irrigation group members gather weekly in the field to work on their own plots and contribute toward maintaining the group's shared irrigation infrastructure. Nearest markets for selling vegetables are located in the Aloet village center, on the Mbale-Soroti Road, and the larger village of Bukedea to the west. The group of 18 irrigating farmers is led by a small leadership committee who were elected by the members. This committee led the process of drafting the group's governance guidelines, rules, and regulations for membership and participation. Formalizing this group structure allowed the community to resolve ongoing issues with one male group member who previously claimed dominance over the group's decisions and resource allocations. This group has successfully negotiated a 2-year rental contract with the owner of the irrigated land, and our project committed to matching farmers' investments in seeds and inputs for this 2-year period. This creates a pathway for the group to build its operations and capital in preparation for negotiating future rental contracts and transitioning to being a fully self-supported horticulture business before the close of our project. Village-level savings groups--known as village savings and loans associations, or VSLAs-- are common in eastern Uganda. The local VSLA, whose membership also includes many of the irrigation group's farmers, established a fund specifically to support investment in and growth of the group's irrigated horticulture operation. Members may take a loan from this fund to purchase inputs, such as seeds or fertilizer, for their individual plots, and pay back the money with interest. The group uses the growing fund to pay for larger expenses, such as hired oxen for land leveling, that benefit all members and which would be impossible for individual members to afford. Our project worked alongside the farmers, irrigation engineers from AMARI, and Busitema University irrigation engineering students in designing and building a gravity-fed irrigation conveyance system from the natural spring. A canal fed by the spring runs along the edge of the valley, which now supplies water to a raised, terraced main canal that runs down the valley slope among the irrigated plots (see image at right). Spiles and small channels are used by each farmer to divert water from the raised main canal into their individual plots. Farmers use raised furrow-basins to direct water within the plots and to control infiltration and drainage. Among other benefits, this system reduces the need to move soil to open and block water intake pathways, which can quickly lead to erosion of furrows and beds especially in the sandy soils of Aloet. 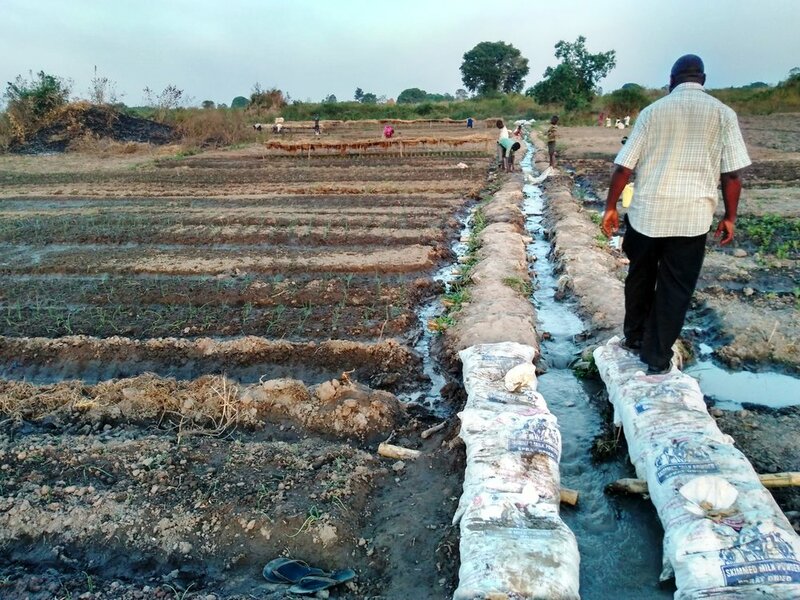 The raised and terraced main canal, constructed of bags filled with soil and lined to reduce seepage, runs down the slope within the irrigated vegetable plots. Members of the irrigation group contribute towards the maintenance of this shared system and get, in return, a plot within the irrigable area where they can grow vegetables.